After the death of Anna's old vampire mentor causes ripples in the mortal world, Anna needs to lie low. But when Max-an FBI agent and Anna's former flame-comes to her with reports that bodies are showing up on the Mexican border drained of blood, Anna has no choice but to get involved, both with the case and with the man who broke her heart. The description of this book is a little misleading as it pertains to events that happen in the very beginning of the book. Crossroads is an very accurate title for the real story, as it is a journey with a major choice at the end. We're talking life altering. Anna has a big decision to make after a huge carrot is dangled in front of her, the chance to become human again. As she travels to find the cure with the help of Frey, she finds trouble in the most unlikely places. If she isn't careful her next step might just be the last one she ever makes. Anna has always been a very brash character, constantly making hasty decisions on the fly. So, I was glad to see her take a step back to really consider the consequences of such a major decision. Something like that would be bound to have a steep price, both personally and due to her position as Chosen, potentially to all of humankind. Anna may think she isn't worthy of being in such a position, but I have to disagree. The entire time she is weighing her choice, the personal cost wasn't the roadblock, but the cost to others. Another worry of Anna's is that she can now kill too easily without remorse, making her no better than a monster. I'll have to disagree with that as well. She needs that ability due to her position, and since she never uses it on anyone who isn't evil or intent on hurting others, I don't think her conscience should worry so much. I really love the dynamic between Frey and Anna. I'm kind of rooting for them as a couple in the long run despite their respective significant others. They just seem to be kindred spirits who understand one another completely. It's kinda funny that they have such a close bond when you consider their inability to read one another's minds due to Anna's long ago mistake. Perhaps it is because of this broken psychic connections that they are able to be so close by being able to let their guards down rather than constantly having to shield from one another constantly. Either way, something about them just seems to work and I can help hoping for more. Of course only time will tell and the twists in this book will make things more difficult than before, but I still think they have a solid chance. I'll be keeping my fingers crossed. I think Crossroads may just be my favorite Anna Strong novel yet. It had a completely different feel to it than the previous books. Some of that is due to the change in location, but mostly it is due to Anna's growth and acceptance into who she is. The Anna we knew from the first book would have jumped through any hoops she could to become mortal again despite the consequences, yet this Anna completely weighed her options to make her choice in the end. According to Jeanne Stein's website, there are only two more books left in the series. Things have been set in motion now and I cannot wait to see where everything ends up in the end. Hopefully Anna will get a least a little slice of happiness in the end. She sure has earned it. 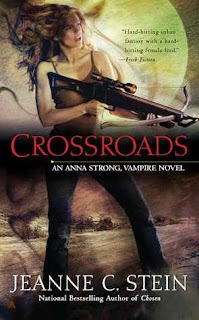 I'm looking forward to Crossroads, as I felt that the last book was too rushed and anticlimatic. Thank you for a great review! Great review!! I so can't wait to read this one either! Can't believe the series is almost over! I was kind of rooting for Frey and Anna as well, hoping that something happens between them! i didn't know the serie, i've just bought the first one. thanks for the review !